Caitlin Kittredge has announced the cover for Demon Bound, the second book in the Black London urban fantasy series coming in December. The first book in the series Street Magic is due for release June 2, 2009. Read my review here and visit Caitlin's blog here. I like the cover, but is it just me, or does the guy look a lot like David Beckham? I have both of her series on my wish list - I guess I'm going to have to order them from the book store. Popinfresh I can see a resemblance but this guy is way more intense then Beckham. Sorry to hear that Michelle. I know it drive me crazy when I go to the bookstore with a wishlist in hand and come out missing a lot on my list. Especially when they are newer titles. Mostly I order online these days with Amazon or Chapters. Do they delivery charge premiums in your neck of the woods? Doug if I order a book to come straight to the book store they do not charge me extra. They will call when the book comes in and I pick it up. It's not so bad - just that the book may take up to 3 weeks to get there. LOL I could order off line - but then they add the shipping charges - of course. <Conjure Man, the second Black London novel, didn’t pass muster with marketing as far as a title. 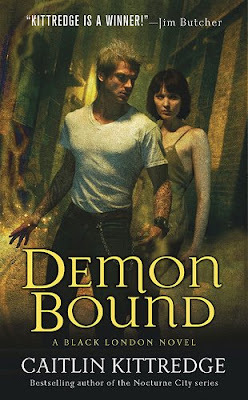 Actually, if the book couldn’t keep its original title, I’m glad it’s Demon Bound. It’s still evocative enough that I don’t feel cheated and hey, demons. Can’t step wrong there. That cover is awesome. Love it tons more than the first book's cover, and I liked that one a lot. I've been wanting to read this series ever since I read a short story for for this series in My Big Fat Supernatural Honeymoon. It was awesome! KMont Chris McGrath does such awesome covers. Caitlin sure lucked out. Hannah you are going to love the novels. Laura Chris McGrath's website is awesome. His gallery has so many wonderful covers you will recognize.